The oculus inside the zero-net-energy VanDusen Botanical Garden Visitor Center in Vancouver, Canada. 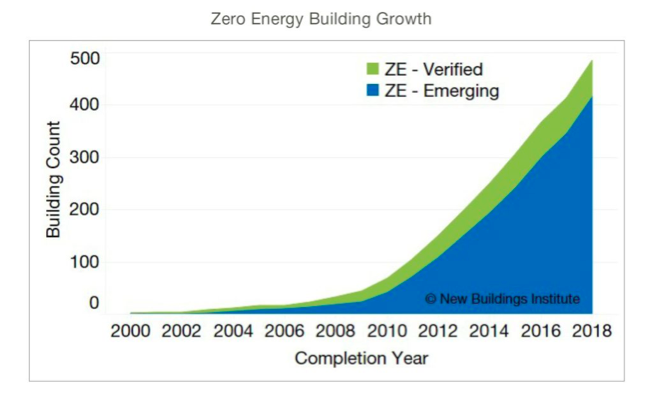 The last two years have been good for zero energy buildings, according to our latest list of certified and emerging zero energy buildings by the New Buildings Institute. This list, published every two years, inventories projects across North America, but more significantly reveals key market trends that signal the overall health and momentum of the zero-energy market. This year, the list includes nearly 500 verified and emerging zero-energy (ZE) buildings across the United States and Canada — a massive 700 percent increase since NBI began tracking projects in 2012, with private sector investment now representing nearly half of all buildings on the list. The 482 buildings represent more than 45 million square feet of commercial space and include 67 verified projects (with at least one year of energy use and production data to prove ZE performance), and 415 emerging buildings (with a stated goal of zero energy, but not yet completed, fully occupied, or still working to attain ZE performance). ZE buildings transcend North American climates and borders with buildings in 44 U.S. states and four Canadian provinces. California is by far the front-runner in ZE building activity with Oregon boasting the second largest count. California’s leading energy policies, ambitious energy reduction goals and effective utility programs, as well as Oregon’s Path to Net Zero efficiency program and incentives are driving their rapid uptake in ZE buildings. Both the Northeast and the Southwest regions saw the highest growth with more than a 90 percent increase in buildings since 2014. The ZE verified buildings on the list on average use 60 percent less energy than comparable existing U.S. commercial buildings and 46 percent less energy than new buildings under one of the most stringent U.S. base code (CA Title 24). The median gross site energy use intensity (EUI) of ZE verified buildings is just 18 kBtu per square foot per year (before renewables). The ZE emerging buildings, a blend of measured and estimated energy use, have a median gross site EUI of 24 kBtu per square foot per year. The majority of verified ZE buildings (roughly 80 percent) are smaller than 25,000 square feet, reflecting the early trend of small demonstration buildings getting to zero. 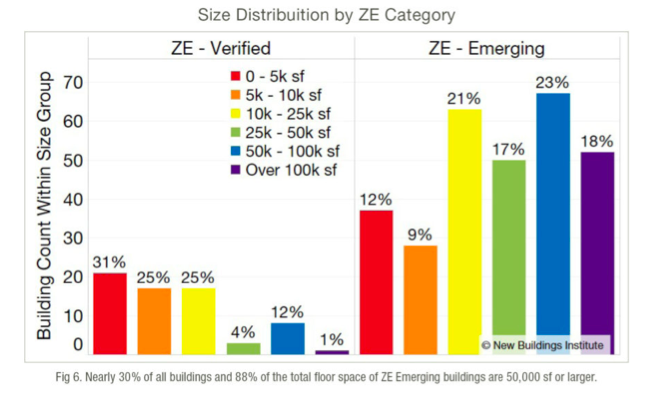 But the 2018 ZE emerging list of buildings show more evenly distributed building size, suggesting that large ZE buildings are entering the market with more diverse sized buildings pursuing ZE. In the 2018 emerging list, more than 40 percent of all buildings, and 88 percent of the total floor space, are 50,000 square feet or larger. ZE buildings can be found across a growing number of building types. Even high-energy intensity building types, such as hospitals and restaurants, are finding innovative ways to pursue ZE. As in years past, the combined education market, which includes K-12 schools, higher education and general education, dominates the 2018 Getting to Zero List, making up 37 percent of the buildings. ZE is finding favor with the private sector, with nearly 26 percent of the full list representing for-profit, private sector buildings and overall private ownership at 46 percent. Home production builders say ZE residential projects have been "profitable, sustainable, and rewarding for their businesses and their customers." The communities and commercial districts are increasing and carving a critical path to scale ZE buildings. A webinar about these trends will be today at 10 a.m. today PST. In addition, RMI is hosting a Facebook Live discussion at 1:30 p.m. March 8 PST to discuss net zero leases as a mechanism to scale NZE in the leased commercial subsector.